Resistance is an evolutionary process by which weeds evolve to become resistant to whatever tools we are using to control them. It’s my contention that resistance cannot truly be eliminated. We can’t stop resistance but we can manage it. We can extend the life of these weed control tools as long as possible, and in some cases a very long time if we do the right things. How does weed resistance develop? On a moderate to large field, there are millions and millions of weeds, and they’re not all exactly the same. There is a rare individual that happens to be resistant to the herbicide that you’re using. You spray and that rare individual survives and produces seed. Over time, as you use the same herbicide over and over again, that particular population grows and eventually what you end up with is a field that is dominated by this resistant population. Resistance has been going on ever since herbicides were developed back in the late 1940s, early 1950s. A couple of examples of resistance to 2,4-D occurred in the 1950s but for a long time, about twenty-five years, there wasn’t very much resistance showing up. Not until around the early to mid-1970s were reports of resistance to triazines showing up, and after that point, the number of resistant cases kept increasing. In Australia, resistant rye grass is a big problem; it’s resistant to almost every mode of action. In Western Australia, more than 90 per cent of the rye grass is resistant to one or more herbicide modes of action. For a long time in Asia, resistance wasn’t a concern because a lot of hand weeding was used, but that’s rapidly changing as labour shortages are developing because people are moving to the city. In China and India, herbicides are being used more and more, and as a result there is more herbicide resistance – in particular some of the grasses that you find in rice and wheat. About 15 to 25 per cent of the rice area in China has ALS resistance in grasses. About four million hectares of wheat in India is infested with resistant wild canary grass. In Europe, resistance is a concern in grass species. 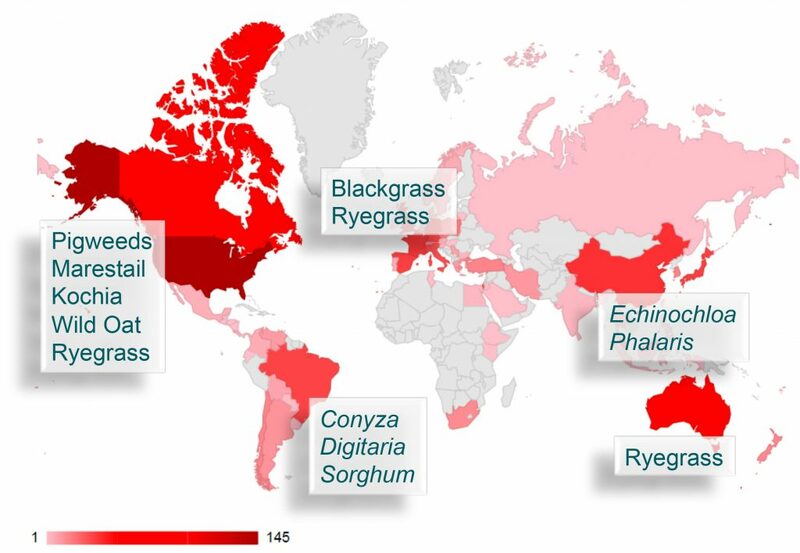 Black grass in the northern part of Europe, and rye grass across Europe are areas of concern. Those grasses, like the rye grass in Australia, tend to be multiple resistant. In some areas of the U.K. they’re pretty much out of herbicide options to control black grass. In the Americas, the concern is glyphosate resistance because of the widespread adoption of glyphosate tolerant crops. In South America, Conyza, a relative of Canada fleabane, is found on approximately 10 million hectares in Argentina; a lot of it is resistant to glyphosate and increasingly ALS herbicides. Glyphosate-resistant amaranthus species have become a problem. In Argentina some of it came from the U.S. on machinery and possibly with seed. In the U.S., resistance is about the pigweeds, mare’s tail, and kochia. Wild oat has been a problem in Canada for a long time. Glyphosate resistance is the big headliner in the news over the last few years. Over the last six or seven years there has been a big increase in glyphosate-resistant weeds – now up to 40-plus per cent of the crop acres in the U.S. are infested with glyphosate-resistant weeds. Again, dominated primarily by pigweed species, and mare’s tail. Target-site resistance is one of the key ways weeds become resistant. The weed has an “altered target site” so it’s not susceptible to the herbicide. Herbicides depend on target sites where they act and then interrupt some process in the plant that ultimately kills the weed. For a long time it was thought that target-site resistance was the main resistance mechanism, and a lot of the early weed resistance was target site. However, non-target site resistance is a mechanism that is more concerning. In this mechanism, the target site does not change. The weed often has an enzyme that attacks the herbicide once it gets into the plant and breaks it down, and therefore makes it unable for the herbicide to do its job on the target site. This is also called metabolic resistance. One of the most concerning things about metabolic resistance is that other herbicide modes of action that may not have been used in that field may not be effective because an enzyme in the weed can break apart several different modes of action. This potentially may even affect new modes of action that come along. Some weeds and some herbicides tend to have more resistance. Weeds like kochia, wild oats, pigweed species, and ryegrass are genetically diverse. This results in a greater chance of a resistance mechanism showing up in any individual plant. Some herbicides are relatively quick to develop resistance because the enzymes they work on are pretty diverse. The Group 2 ALS herbicides develop resistance pretty quickly. Group 9 glyphosate is thought to have a pretty robust resistance mechanism. The enzyme in the weed that glyphosate works on doesn’t have a lot of variability, so it is a numbers game. 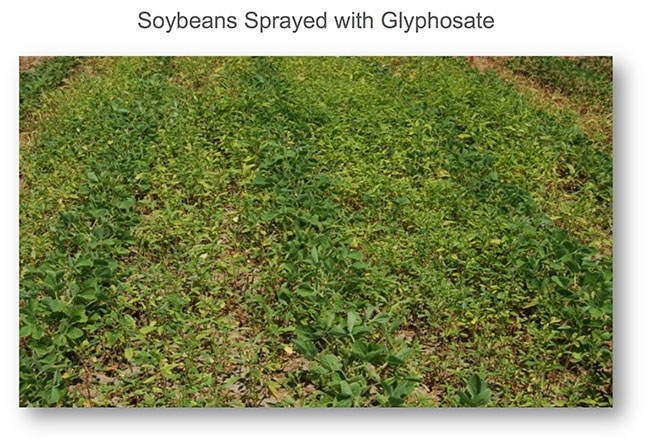 Because glyphosate became so popular after glyphosate-tolerant crops, and glyphosate was sprayed so many times, that heavy selection pressure resulted in resistance. Companies are continuing to innovate but it’s not easy. A lot of the low hanging fruit has been picked. They are looking for increasingly rare compounds that have to provide good performance and are broad-spectrum. There are a few ‘thought-to-be new’ modes of action but they are quite a few years away. Some of these molecules are quite expensive so it’s not going to be cheap. Some get thrown out because of toxicology or environmental characteristics, which leads to problems with regulatory approval. These are big hurdles that companies have to get over if they’re going to come up with something new. Are herbicide-tolerant crops a solution? After glyphosate-tolerant crops there is the next generation of herbicide-tolerant crops. Monsanto Extend technology and others like Dow Enlist can help. These new traits add some new tools to the toolbox for a given crop. For glyphosate-resistant waterhemp, the Enlist trait uses 2,4-D in the tank-mix to turn back the clock and get clean fields again. But you cannot turn back the clock entirely. You cannot go back to the same practice of just spraying that same herbicide post-emergent over and over again. The new traits have to be used as part of a program or you will end up right back in the same spot again. Gene editing is a new technology that is different from GMOs. It is a way that the genetic material of a crop can be edited without interjecting anything new into it. Basically rearranging genetic material like plant breeders have done for many thousands of years. It has been demonstrated for ALS tolerance in canola, dry beans and rice, and glyphosate tolerance in flax. Currently, in a lot of jurisdictions these are not considered to be GM crops. But again environmental groups are looking at ways that they can generate a lot of fear around these, too. But for now, these tend to have an easier path to approval, so we’ll see what comes of it in the future. RNA interference is another potential technology for the future. DNA is the blueprint in the weed for plant development, and proteins are the bricks and mortar that make up the plant. RNA is the means by which that blueprint gets translated into the actual bricks and mortar. What’s been discovered is that the RNA process can be interfered with by developing similar RNA types that break up that process. Potentially, this could provide unlimited modes of action. It can also thwart the weed’s processes for the development of resistance. RNAi is an exciting technology but you’re not going to see it right away. There are a lot of hurdles. First, the development of field stable formulations will be necessary. These are fragile molecules, that don’t hold up very well in the environment. They are slow acting so if you’re trying to thwart resistance you probably have to spray RNAi products first and then spray an herbicide. RNAi products are very highly specific so a product has to be developed for each weed and each herbicide combination. The regulatory path is also uncertain; we really don’t know how regulatory agencies are going to look at these. And resistance will develop to RNAi technology as well – this has already been have determined on the insect side. Robotic weeding may be a possibility that is starting to come of age. John Deere recently acquired a company called Blue River Technology that’s focussed on this area. A website at www.seeandspray.com has a video that shows some of the potential for this technology. We have to keep an open mind in terms of new things to come. We’re going to have to find new, non-chemical means in order to keep our herbicides supported. How do we do the things that are going to maintain longevity of the tools we have in our toolbox right now? A lot has been published on best management practices, but I think it boils down to three main areas. One is to manage the seed bank. The best thing to do is keep the weed population low. You have to scout and control escapes. For example, if you have a wet spot in the field and you drive around it all season, don’t let the weeds go to seed. Some of weeds produce several hundred thousand seeds per plant so there can be millions of seeds coming out of that patch. Control weed seed production throughout the entire year using different methods. Second, make sure to use herbicides appropriately. Spray weeds when they’re small. If you’re spraying big weeds, you’re putting more selection pressure on that herbicide. It is really critical to use the right rate at the right time. Finally, diversification of weed control practices is critical. Use multiple modes of action. Those modes of action should be overlapping. Use different cropping systems and different cultural practices such as injecting some tillage or maybe some delayed seeding. In Australia, they’ve had some success with harvest weed seed control. Cover crops provide benefits in reducing weed populations as well as nutrient management. In some areas they aren’t practical because of the short growing season, but they can help with resistance management. We know what we need to do but what’s preventing us from doing it? We have to be practical. We have to understand what farmers are up against. Macro-economic factors are something that everybody has to recognize as barriers. Some of these resistance management practices require increased investment of time and dollars. It’s important to acknowledge this and figure out how to deal with them as we try to implement best management practices. Companies have stewardship programs because it costs hundreds of millions of dollars to develop new technologies and they can’t afford to loose those products within a few years. They spend money on research, education, farmer advisor resources, and farmer incentives. More and more I’m seeing public/private education partnerships. One that I often point to is the Take Action program that’s supported by the United Soybean Board. I would encourage you to work with your commodity groups to develop practices that fit your area and with your crops. Weed resistance is a communal issue. Everybody has to play if we’re going to solve it. The Global Herbicide Resistance Action Committee is part of Crop Life International. It consists of a host of associated organizations, industry organizations around the world. As an industry, we work together across companies to try to develop research programs, support symposiums for researchers, and share information on resistance to make sure there is a robust network of people working on resistance. 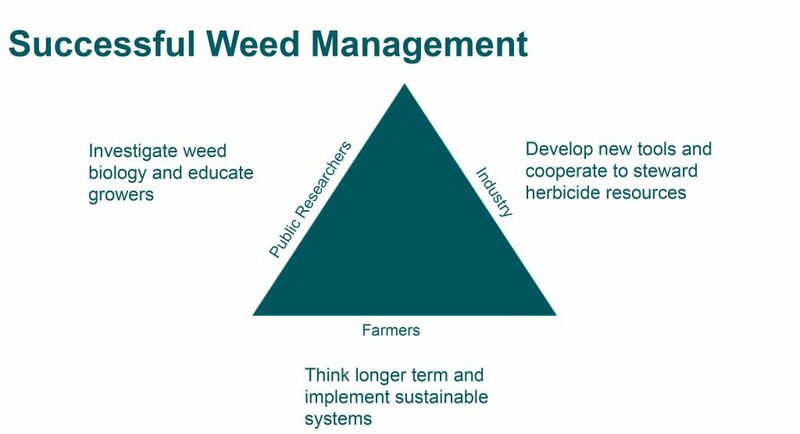 But at the end of the day, I think successful weed management really requires everybody to work together. Public researchers investigate weed biology and to help educate growers. Industry works on new technologies for the market place, and try to steward those that we introduce. And I think farmers are helping to solve this problem by thinking longer term to implement sustainable systems on their operations. What can we learn from the loss of the world’s greatest herbicide?